The mighty Ephesus has always been the only kebab shop worth frequenting, the one in Sussex road falling way below the reasonable expectations of bab connoisseurs such as ourselves. We naturally greeted the news of a new contender to the throne with much interest and mouth watering anticipation. Could this be the new place to get our sumptuous Turkish delicacies to take away, or was it merely a pretender, clearly out of its league? We have awarded Heath points TM in 4 main categories, Location & Practicality; Service; Value for Money & Kebab Taste Test. Grading is on a sliding scale with 0 being the poorest and 10 indicating an Ephesus equivalent. For this test we have used an Ephesus small doner with either chili sauce or mayonnaise as the scientific 'control'. 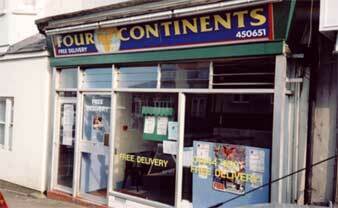 Situated on the site previously occupied by The Rose of Bengal, the 4 Continents is based in a prime location for people who sit in cars outside the b2, frequent the Burrell Arms or have just come back from an evening's entertainment in either Brighton or London. Cleverly, the proprietor has chosen to stay open until 1am, thus picking up trade from South Central's ridiculous weekend rail timetable. Compared to the 11:30 pm (ish) closing time and grueling hike up Perrymount Road to Ephesus the 4 Continents is certainly favourable if you are considering a snack when traveling on foot in a westerly direction after hours. Failing that, they do deliver to your door, which is an added bonus. Mark: 9 Heathpoints TM - As good as Ephesus, providing you happen to be coming from the bottom end of town although you can order in if you're feeling lazy. We visited the 4 Continents at prime-time, 11:30 pm on a Friday night and in these early days were unsurprised to be the only ones there. We responded to the warm and friendly welcome with an order of 2 small doners, one with chili sauce and one with mayonnaise (brand unknown). With a full hour and a half left until closing, and right in the middle of kebab eating prime-time, we were dismayed when informed that there wasn't enough doner meat for 2 kebabs, not even pot meat. Reluctantly we settled for 1 chicken and 1 doner kebab. Apart from this oversight, the service was acceptable and we were politely invited to choose from a wide range of toppings. Mark 6 Heathpoints TM - Ephesus would never run out of meat at their busiest and most prosperous point of the evening. In the value for money stakes the 4 Continents made a slow start with Ephesus ahead by a length at the third furlong. In short though their extensive menu included the Shetland pony of babs, the doner roll, the price for our takeaways came to £3.15 for a small doner and £3.20 for a chicken kebab. As we dug deep into our pockets for the correct denomination of currency the proprietor informed us that the prices on the menu were not correct and he proceeded to add an additional 10 pence to each of our kebabs! This left a slightly sour taste in our mouth, which was a sign of things to come! Mark: 4 Heathpoints TM - More expensive than Ephesus and an erratic pricing strategy leaves Ephesus the bookies favourite and the 4 Continents a 25-1 long shot. None of the above is worth a bean when compared to this category, the taste test itself. The first problem encountered was the heat life span of the kebab. After a 5-minute drive to my colleague's flat the doner kebab was stone cold. Contrast this to an Ephesus kebab, which has been known to travel from Haywards Heath to Crawley (for research purposes only) and still be acceptably hot. On the basis that, dear reader, your reviewer could not be arsed to deconstruct his kebab and microwave the meat, the whole lot went in leading to warm salad and the corruption of that most delicate contrast twixt meat and greenery. Biting into the kebab the warmth of the chili sauce was evident. Strong yet restrained the piquancy of the sauce was, however, marred by the overt presence of tomato leading to a distinct, and ultimately tiresome, chili ketchup motif. The warm salad was fairly crisp and chopped, which made consuming easier and cleaner, along with a soft pita. However, we concluded that such a soft pita would have a low resistance to grease likely leading to collapse. The meat was rather curious, its true taste clearly masked by other elements such as the chili ketchup. Pure doner meat tasted somewhat undercooked and the last few pieces proved inconsumable for this tester and the kebab was abandoned. Mark: 3 Heathpoints TM - Cold to start with, dodgy chili sauce and suspected undercooked meat, this doner kebab was far from pleasurable. Faring well in terms of location and practicality the 4 Continents lets itself down in every other category, most importantly in the taste test itself. Late opening times and a delivery service are welcome features but not enough to force Ephesus to abdicate from the doner throne. If you have experienced a kebab from the 4 Continents or anywhere else in Haywards Heath (there are only 2 others we know of) then why not mail us with your comments. Finally I'd like to wish the 4 Continents every success in their new venture, hopefully they will learn from their mistakes and improve so that one day, they may be a worthy adversary to the King of Kebabs, Ephesus. On the strength of the one kebab we sampled we will remain loyal to Ephesus though maybe one day we'll return to see if things have improved.